Leave Comments Here and promote Your Blog. Aluminium composite sign panels, 4490mm x 740mm. Cream text on brown/coffee coloured backing. Sign fitted into an existing box sign. Location of sign 407 Charminster Road, Bournemouth. A lovely and inviting coffee shop and makers of tasty sandwiches. 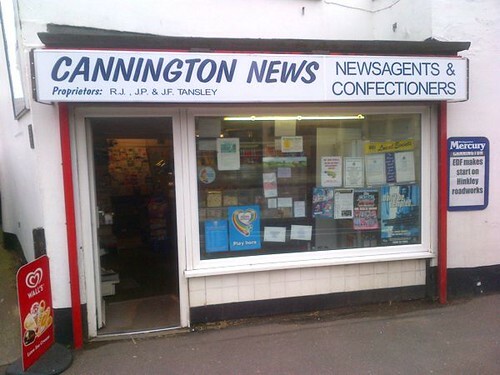 cannington-news, a photo by Signmakersuk on Flickr. Aluminium composite news agents shop sign, to replace an existing sign with the same layout as previously seen on the shop. The customer supplied a photograph of the previous shop sign which we then copied. A sign made from 3mm aluminium laminate. 5490mm x 457mm supplied and fitted in Bournemouth. The sign was supplied as three sections and screwed direct to the brickwork. We also supplied vinyl lettering that was cut in reverse and fitted to the inside of the window. www.itsepic.co.uk for embroidery and printing. Something pink something blue shop sign made from aluminium composite, vinyl lettering and Logo. The customer gave us a sketch of what they were looking for, we then emailed a layout to the customer on a PDF file. Alterations were then made to the layout and then the layout was sent for approval. Once the customer was happy with the visual we proceeded with the sign and fitted it to their shop front. The shop was located in Boscombe East, Christchurch road, Bournemouth and was fitted in January 2012. 750mm x 4880mm vinyl faced aluminium laminate sign. Apple green vinyl with black text with a white outline. Sign supplied to customer for DIY fitting. Beauty Salon shop front sign layout. The sign was made of 3mm thick aluminium laminate. Vinyl faced with purple. The letters were gloss silver and the font used was called Bauhaus Md bt. The customer supplied the initial visual which we then adjusted to fit the size of the shop front. The new layout was then emailed back to the client for approval. The sign was then made and sent via TNT delivery service to London for the customer to fit. The size of the sign was 1000mm high x 4850mm long. Funky Fresh Shop Front Sign. Purple shop sign with vnyl lettering applied onto a 3mm thick aluminium composite.